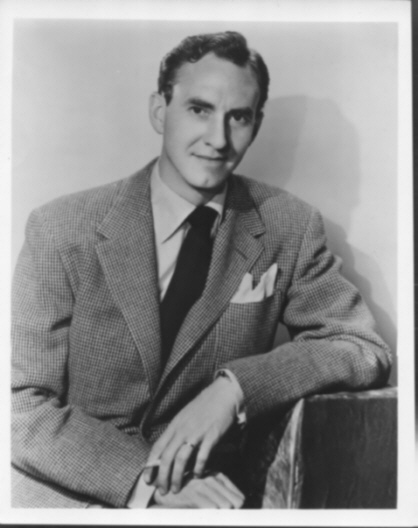 Lawrence Welk's Deep Throated Bass Vocalist Scored Hit Song "Oh, Happy Day"
Larry Hooper was a versatile musician and vocalist for the Lawrence Welk Show from 1948 to 1969 and again from 1973 to 1980. Hooper was born July 22, 1917 in Independence, Missouri, just outside of Kansas City. After playing with the Frankie Masters band, he joined the Welk band in 1948 when they were doing nighters at the Roosevelt Hotel in New York. His trademark deep bass voice and renditions of "This Old House" and "Asleep In The Deep," along with his sense of humor has made him a beloved fan favorite. He also scored hit songs with "Oh Happy Day," and "Minnie the Mermaid." Plagued with health problems for years, he left the show on sick leave in 1969 because of a heart condition, which took him four years to recuperate from. He returned for the first show of the 1973-74 season, which drew an huge emotional ovation from the audience and cast. He left the show for good in 1980 when his health began to fail once again, and passed away three years later in 1983. Larry's wife of 31 years, Beverly Hooper, passed away in 2013 at the age of 86 years old. They are both survived by their daughters, Lori Hay, Melinda Shepherd, and Lisa Neale.